Bruce Coville is the bestselling author of nearly 100 books, including the Unicorn Chronicles series, Magic Shop series, My Teacher is an Alien series, and The Sixth Grade Alien series. The Sixth Grade Alien books were the basis for a television series on Fox Family in the United States. In all, Bruce has over 12 million books in print. He's also the founder of Full Cast Audio, an audio book company producing unabridged recordings of children's and young adult books, using full casts rather than solo readers. Matthew Peterson: You’re listening to The Author Hour: Your Guide to Fantastic Fiction, which can be found at www.TheAuthorHour.com. I’m your host, Matthew Peterson, author of Paraworld Zero. My next guest is Bruce Coville, bestselling author of over 95 books for young readers, which include the Unicorn Chronicles series, Magic Shop series, My Teacher is an Alien series, and The Sixth Grade Alien series. In fact The Sixth Grade Alien series was the basis for a television series on Fox Family in the United States. In all, Bruce has over 12 million books in print. He’s also the founder of Full Cast Audio, an audio book company producing unabridged recordings of children's and young adult books, using full casts rather than solo readers. Thanks for being on the show today, Bruce. Bruce Coville: It’s my pleasure, Matthew. Matthew Peterson: Before we get going into your books, I just wanted to say that I think that Full Cast Audio is the coolest idea. My wife and I did the narration for my first book, Paraworld Zero, and I know how hard it is to come up with all those character voices. Matthew Peterson: Do you get a different person to do each voice in the cast or do they do multiple voices? Bruce Coville: Some of our more versatile actors will do multiple voices, especially if they come in, and then there’s a period of an hour before another character comes in and then a period of an hour before another character comes in. But for the lead roles, there’s an individual actor for each of the lead roles. One of the things we pride ourselves on is age-appropriate casting. Bruce Coville: So which gives us kids, which gives an entirely different sound to it. Matthew Peterson: Oh, yeah. It’s more authentic that way. Yeah, that’s great. I started listening to audio books just a few years ago, and it dawned on me after listening to the first one that there was only one person who did all those voices. And I was like, “That was just one person! I thought it was a whole bunch of people!” So that’s just an amazing medium. I love it. So I just wanted to talk about that briefly. Bruce Coville: I’ll talk about audio books as long as you want me to. I’m beside with them. Matthew Peterson: Yeah. They’re just the coolest thing for me. ‘Cause I had to drive for two hours a day and I just really got into them a few years ago. And haven’t stopped. So I know everyone out there is dying to hear about your unicorn books, and we’ll get to that in a moment, but I wanted to first talk to you about your Alien books. You have quite a few of them. What made you decide to write all these funny, quirky alien books? Bruce Coville: Well, I sort of fell into it actually. In the, oh gosh, would have been in the late ‘80s, early ‘90s, I was doing work with packagers and some of your listeners will probably know what that is, but a quick reference is Nancy Drew and Hardy Boys, those are packaged series. There’s a company that concocted them, the Stratemeyer Syndicate in that case. Then they hire various writers to do them under their house names. The packager that I worked for did not use house names, but their system was that they’d come up with a series, they’d sell it to a publisher--this still goes on and on a lot--and then hire writers to do the books for them. So I had done... I had already published a few books on my own, but this was good bread and butter work. And there’s a long story behind this, but basically they had a contract had gotten messed up and they wanted a fill-in book. Bruce Coville: And I sat with Byron Price, who is the head of this company, and very significant in science fiction and fantasy, died tragically earlier in a traffic accident a couple years ago. And he started saying to me, you know, “How ‘bout this? How ‘bout this?” ‘Cause it was their job to come up with the concepts, and he said, “My Teacher’s an Alien.” And I almost went across the table because it was the best title I’d ever heard. Bruce Coville: And I hadn’t thought of it myself. What Byron did not know is that I was oddly appropriate to write the book because when I was a kid, a rumor went around our school that on a certain day aliens were going to land and take away all the kids. Nobody totally believed it, of course, but you didn’t totally disbelieve it either because when something is said over and over again it takes on a weird kind of reality. That’s how politicians get away with so much stuff. Bruce Coville: So we were all talking about “What do you do?” And I knew what kind of tension rose in the school, so I had this background to work from, and the book, which was meant to be a stand alone book, took off unexpectedly. It made me an overnight success, after 14 years of publishing. Matthew Peterson: Yeah. Well, I mean, there’s a whole TV series. Bruce Coville: Well, actually the TV series came later. It was another alien series. But so clearly aliens and I had thing going on together. So we negotiated a deal for some more books in that series. The fourth book, My Teacher Flunked the Planet, is my best-selling book ever. It’s also, in some ways, my most important book and also a secret between me and the kids because it’s very political, very philosophical; I could not have gotten away with that, it’s still very funny and very adventurous too, but it’s got a lot in it that I couldn’t have gotten away with in the first book. But the success of the first books gave me sort of license to talk about, really, I thought important ideas. And because it’s a paperback original, because it’s got a goofy title, it didn’t get any review attention, because it was fourth in the series. We sold well over a million and a half copies. But it’s a secret between me and the kids. Then I went on to do the Aliens Ate My Homework series, Rod Allbright is based on me, the Space Brats series, the I Was a Sixth Grade Alien series. I just like writing about alien stuff, because it’s a way to do fish out of water comedy. As soon as you bring an alien in, you have cultural misunderstandings. Bruce Coville: And aliens, you can also do social criticism because aliens can look at us from the outside. We all know this in our own lives –we have a friend who’s doing something, it’s so obvious that what their doing is messing up their life, but they can’t see it because they’re inside of it. Aliens can kind of look at us and say, “Ah, you people, why do you do this? There’s enough food to feed everybody on the planet. Why are people starving at the rate of 40,000 a day?” Aliens can see us from the outside and view us beyond our own mess. So it’s a great way to talk about social issues in a very comic context. Matthew Peterson: Yeah. And these are for school children. And, like you said, they’ve sold quite a lot of books. It has been a while since you finished writing the last ones in your series there. Do you have any plans or can you even foresee writing any more alien books in the future? Bruce Coville: Oh, yes! I would love to do another book in the Aliens Ate My Homework series. Matthew Peterson: Yeah. I love that title. [laughs] I have twins that are nine and I have another that’s seven and I think that this would be... great age for them to read these. Bruce Coville: Nine year old boys are my prime audience when I’m writing alien stories. The Rod Allbright books I particularly like because Rod is the only character I’ve ever base totally and completely on myself. The series did very, very well, but the publisher messed up the distribution on the fourth book so much that it sort of killed it for the time being. I’ve got a seed for another book, which I might go back to at some point, but I’ve been off on fantasy in recent years as my primary venue for working. Matthew Peterson: Yeah. Well, let’s talk about the Unicorn Chronicles. The first two books came out over ten years ago. And I think the question a lot of people always ask is why did it take so long for third one, ‘cause they were so successful. Why did it take so long for the third one to come out? Bruce Coville: Well there’s a few reasons. 1. It’s just really bad planning on my part. Matthew Peterson: [laughs] Here we go! Actually, let’s go back to that first book, The Land of Unicorns. You know, you said it was back in 1994. Just get a little basis for the Unicorn Chronicles series. The main character is Cara. Tell us just a little bit about how the series begins. Bruce Coville: And we started to toss ideas back and forth and she said, “Unicorns.” And I said, “I’m there.” ‘Cause I’d already done... my second picture book was called Sarah’s Unicorn, one of my most well-loved books. I’d done a collection of unicorn stories, an anthology that I’d edited and written for. And I’ve always been fascinated by the unicorn mythos. So we agreed on that, and I created a bible for the series, which sort of lays out the concept for the world and what’s going to happen and I started to write . . . I wanted the main character to be a little girl from the barrio and her name was Rafaella de la Cruz, because I thought, “My books are just all about middle class white kids.” ‘Cause I was a middle class white kid, and I used to be a teacher, and I taught middle class white kids. Bruce Coville: I thought, “I ought to mix this up some.” But I realized after about three months I could not write honestly. Even though I was taking this kid out of her culture, so I thought it wouldn’t be a problem, she was formed by her culture, of course, which I should have known immediately. Bruce Coville: And I didn’t know her well enough to write the book honestly. So I set aside everything I’d done and I used my daughter as the main character instead, ‘cause I did know her. 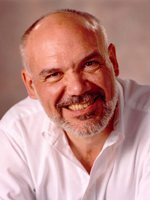 Bruce Coville: My daughter’s name is Cara. So I thought, “Well, what would Cara do?” And that I could figure out pretty easily, and in another three months I had the first book, Into the Land of Unicorns. I’ve never tackled anything this big and with so many tangled strands before, but everything’s coming together now at the end and I’m really hoping to wrap it up in the next few days. Matthew Peterson: Well, that’s exciting. I saw the new cover, and it’s simply beautiful. Bruce Coville: Isn’t that fabulous? This artist, and I cannot say his last name, he goes by Ptar; he’s a Ptar. He’s Dutch, I believe. And I just think he’s sensational. Matthew Peterson: Oh, yeah. You know, a lot of times you don’t judge a book by it’s cover, but I would pick up that book just because of that cover. It’s amazing. Bruce Coville: We teach kids not to judge a book by the cover, but adults do it too. And I know that I live and die on my covers, ‘cause if the cover doesn’t intrigue, it doesn’t get picked up; if it doesn’t get picked up, you don’t have a chance to have the kid discover what’s inside. Matthew Peterson: Yep. Exactly. Well, is there anything you can tell us about The Last Hunt, the last book in the series? Bruce Coville: Oh, let’s see. I don’t want to give away any of the surprises. I will tell you there are major changes in store for some of the characters and there are also major mysteries revealed. Things that we’ve been wondering about, we will finally know the answers to. And I hope there will be surprises and I hope they will be satisfying surprises. Matthew Peterson: Well, that’s good. Bruce Coville: There are about 10 separate story strands going on in this one, which is one reason it’s been so difficult for me to do. Bruce Coville: I had no idea what I was getting into! Matthew Peterson: I can imagine. Bruce Coville: There will not be a cliffhanger at the end of this book. It resolves everything. Matthew Peterson: Alright. Well, I’ve been speaking with Bruce Coville, bestselling author of the Unicorn Chronicles. The last one is coming out, The Last Hunt. Take a look at it. Thanks for being on the show today, Bruce. Bruce Coville: It’s a pleasure, Matthew, thank you. Matthew Peterson: Be sure to visit www.TheAuthorHour.com to listen to the bonus questions. I’ve still got Peter Morwood, Diane Duane, and Tony Abbott, so don’t go away!